James “Whitey” Bulger mug shot. The featured photo is a mug shot of James “Whitey” Bulger after being arrested in Miami Beach on December 2, 1955. Years later, Bulger became the boss of the Winter Hill Gang in Boston until he went into hiding in December of 1994. He remained at large for sixteen years until he was found and arrested in Santa Monica, California on June 22, 2011. More than a decade prior to Bulger’s arrest in Miami Beach, he lived in a rooming house on North Miami Avenue in Miami. Starting at a very young age, James was constantly in trouble. In 1944, at the age of fifteen, Bulger left Boston for Miami. Given his troubles in Boston, he probably left for a change of scenery and a fresh start. He lived in Miami for two years and worked painting cars at Johnnie & Mack Auto Body Shop. 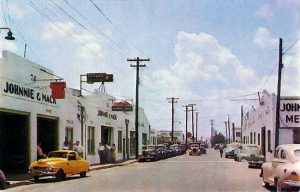 The shop was well known in Miami with the slogan “Johnnie & Mack down by the track”. It was located at 74 NE 20th Street, which was just east of the FEC Railroad tracks on 20th Street, which is where it got its catch phrase. While his actual address wasn’t known during his time in Miami, Bulger may have resided at the Dubbins Apartments. The apartment building was located at the corner of North Miami Avenue and 20th Street. The Dubbins Apartment building was operating as a rooming house during the mid-1940s. It was located a short distance from where Bulger worked. The 1924 building still rents apartments today, and it also is the location of the popular Kush restaurant located on the ground level. 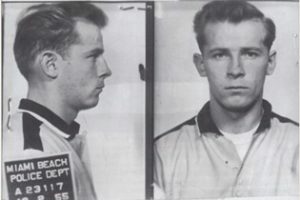 Bulger returned to Boston in 1946 and was arrested and sentenced to juvenile reformatory in 1947. He was seventeen at the time of his arrest for unarmed robbery. James was released from the reformatory in 1948 and joined, served and was discharged from the Air Force prior to returning to Miami in 1955. 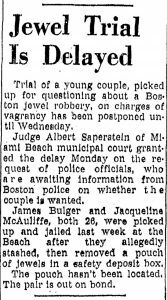 Although the Miami Herald article on Bulger’s 1955 arrest indicated he was detained for robbing a jewelry store, he clarified the story. According to correspondence with author Avi Bash, Bulger stated that he was followed for suspicion of possessing stolen jewels. A bank employee, who watched Bulger open a safe deposit box, reported that he had a bag full of diamonds fall onto the floor. She told the police that he was suspicious. James believed she concocted the story to give police probable cause. Bulger did possess stolen cash, but the police could not find any stolen diamonds. They ended up detaining him and his girlfriend on vagrancy charges. He was bailed out of jail and appeared before a judge a few days later. The judge dismissed the charges on the condition that the couple leave town immediately. Although Bulger did return to South Florida on a number of occasions later, he did comply with the judge’s orders and left town after gathering his belongings. Read more information at “Organized Crime in Miami” by Avi Bash. Special thanks to Avi for providing additional background and permission to use the featured photo. Cover: Mug shot of James Bulger in 1955. Courtesy of Avi Bash. Figure 1: Johnnie & Mack Auto Body at 72 NE 20th Street. Courtesy of Miami Memory Lane. Figure 2: Article in the Miami Herald on December 6, 1955. Courtesy of Miami Herald.